Caption slip reads: "Photographer: Wesselmann. Date: 1954-08-03. Reporter: Wilson. Assignment: Policemen injured in fire at 2nd and Grand. 35: Being treated at Georgia Rec. Hospital by nurse June McAllister is Policeman Mike Forbes with bruised knee. 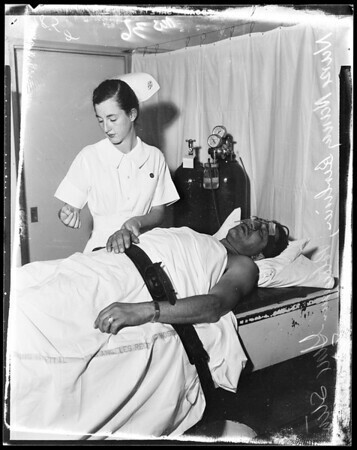 36: Nurse Nancy Berliner is taking pulse of policeman Gene Stein who was overcome by smoke".